There once was a man who faired very well through this life and he had all that heart could wish for. Then the day came that the man died and was walking down a golden road when he came upon a huge beautiful mansion and he was motioned to come closer by a gardener who was tending the property. The man could not believe his eyes at the beauty of the grounds and the vastness of the mansion as he said to the gardener……. I didn’t think I would make it to heaven and live in such a place, and the gardener said Oh’ Sir this is not your place yours is up the road a bit. The man continued to walk and he came upon another place just as beautiful as the first only not quite as large yet it was nice and sufficient, once again as he drew closer a man met him at the door only to be told his place was a little ways down the road. As he started to walk again he noticed the road below him was no longer paved of gold and the homes he was passing were not as nice, and he found himself standing in front of what looked like a shack and sure enough there was someone standing on the porch waving him in and when he made it to the porch the man stretched out his hand and said you made it! Welcome to your new home. The man could hardly look up and asked How do you know this is my place? The man replied it was taught you throughout your life how if you serve God he will bless the labor of your hands, yet if things become more important and you begin to store as much as you can and God is no longer the center of your life only just a part of it then your treasure is set more on earth than in heaven and you are now standing in front of what material we had to build your treasure here in heaven with!. (Luke 12:16-21). And he spake a parable unto them, saying, The ground of a certain rich man brought forth plentifully: And he thought within himself, saying, What shall I do, because I have no room where to bestow my fruits? And he said, This will I do: I will pull down my barns, and build greater; and there will I bestow all my fruits and my goods. And I will say to my soul, Soul, thou hast much goods laid up for many years; take thine ease, eat, drink, and be merry. But God said unto him, Thou fool, this night thy soul shall be required of thee: then whose shall those things be, which thou hast provided? 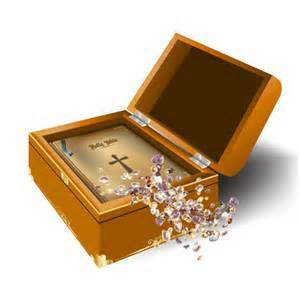 So is he that layeth up treasure for himself, and is not rich toward God. If we seek the kingdom of God as we live we attain the full value and worth of who God really is, we will be blessed in this life and the one to come. (Luke 12:31-34). But rather seek ye the kingdom of God; and all these things shall be added unto you. Fear not, little flock; for it is your Father’s good pleasure to give you the kingdom. Sell that ye have, and give alms; provide yourselves bags which wax not old, a treasure in the heavens that faileth not, where no thief approacheth, neither moth corrupteth. For where your treasure is, there will your heart be also.